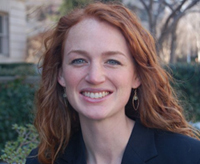 Molly Kinder ’01, who majored in political science and peace studies at the University of Notre Dame, will receive the 2012 Distinguished Alumni Award from the University’s Kroc Institute for International Peace Studies. Kinder, a native of Buffalo, New York, is director of special programs for Development Innovation Ventures in Washington, D.C., a new initiative at the United States Agency for International Development that funds groundbreaking approaches to global development challenges. Kinder will accept her award from the Kroc Institute in March and also will deliver the keynote address at Notre Dame’s Student Peace Conference. Before joining USAID, Kinder worked as a senior policy analyst at the Center for Global Development in Washington, D.C., where she directed the U.S. development strategy in Pakistan initiative. She is the co-author of the report “Beyond Bullets and Bombs: Fixing the U.S. Development Approach in Pakistan” as well as the book Millions Saved: Proven Successes in Global Health, a collection of stories about global health programs that is required reading in more than 60 universities worldwide. In 2004, when a devastating earthquake struck the northwest region of Pakistan, Kinder was working at the World Bank in in Delhi, India. Two weeks later, she moved to Islamabad to join a team that negotiated a half billion dollar loan to Pakistan’s government for earthquake reconstruction. Later, in the wake of U.S.-led efforts to counter extremism and the military campaign in Afghanistan, she helped create the Center for Global Development’s Pakistan initiative. Kinder also holds a master’s degree in international development from Harvard’s Kennedy School of Government. As a graduate student, she was awarded a fellowship to work for the Liberian government as a consultant on poverty issues. She co-authored a policy report on ways to maintain Liberia’s security by economically empowering women. The report earned the Harvard Women and Public Policy Program’s Jane Mansbridge Research Award for best paper in the area of gender and public policy. When Kinder presented the report to Ellen Johnson-Sirleaf, Liberia’s — and Africa’s — first female president, Sirleaf asked for 500 copies to distribute to policymakers. As an undergraduate in the College of Arts and Letters, Kinder was active in Notre Dame’s Center for Social Concerns and volunteered in Chile, Kenya, Washington, D.C., Mexico, and Appalachia. She also was the first-ever female member of Notre Dame’s Irish Guard. Kinder has worked in India and Pakistan as a consultant for the World Bank on poverty reduction, energy, and infrastructure, and has served as a consultant for the Bill and Melinda Gates Foundation. She also has served as deputy chair of the nonpartisan Clinton Global Initiative as deputy chair of the organization’s poverty alleviation working group. She is a term member of the Council on Foreign Relations, a Truman Security Fellow, and founder of the Truman Women in National Security group. Originally published by Renée LaReau at al.nd.edu on January 30, 2012.